1) First off, what’s the (2) i write, you might ask? Well, the 0.6 and 0.85 are Duet (1) boards, while Duet WiFi and Ethernet are (2). I guess the numbering started popping up, as they are working up to the release of number 3 next year. Just a guessing of mine mind you. Regardless though, it’s means my very first pre-ordered Duet WiFi was also a Duet 2 WiFi. Up untill now my newest model has been a 1.02, and since then I can see; 3 new mini removable fuses added, new pins for jumpers and for selection of fan header voltage. Reset button has been moved and the Erase button has been replaced by jumper header, so we don’t accidentially Erase our config! The biggest change I guess, is me though! uhh? We need YAT terminal program. In my previous old post I said Pronterface/Printrun, but that one converts letters uppercase, so it’s no use for setting up most WiFi passwords, and other things. Place you’re Duet controller on a safe surface like a silicone pad, a table or piece of paper. Just do not use the anti static bag it came in, as a conveniently platform, as they basically work in reverse that way, from when the electronics are inside. Connect your Duet WiFi to your computer using the USB cable that came with it. If you have allready installed the Duet Driver, the board might allready just show up in your Device Manager. If it does not, install the drivers and you should be fine. If you need help to get it to show up, you can find detailed instructions here, on Duet3D Dozuki. Note: If you are using some random USB cable you might experience that nothing happens. I’ve also tried having to reboot my computer before something happened. Especially if I previously had worked in Cura or other programs that likes to hog the Com ports. If it’s bugging you, you can find detailed instructions here, on Duet3D Dozuki. Now that you have YAT connected to your Duet WiFi, you issue the command M115 (just enter M115 and hit Enter) and watch the response in the Monitor Window as shown below. 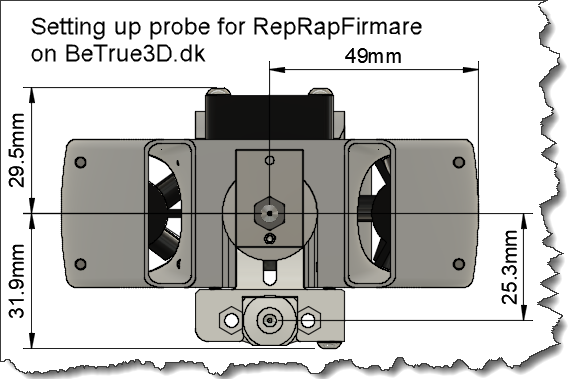 Now go to Github page for RepRapFirmware and check for a newer version. Here we can see that the newest current version is 2.02RC5 (RC = Release Candidate). In order to get this we download the Duet2CombinedFirmware.bin file. Also download the newest current version of the DuetWebControl-nnn.zip file. This zip archive is what makes up the Web GUI (Graphical User Interface) for our Duet. Save them someplace you can easily find them for when we are doing the actual upgrade. There are a few steps to get the Duet WiFi connected to our local WiFi. First step is to check out the current status of the Duet’s WiFi module. You get the current status by issuing M552 command. Mine was listed as idle, but if yours is listed as Disabled, you just issue M552 S0 to get it into idle mode. Now we use the M587 command to add our local SSID (network name) and password to the Duet WiFi’s internal storage. 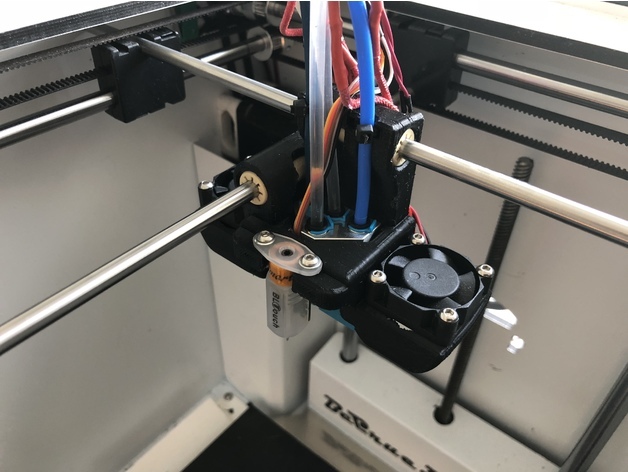 If you are having issues, you can get detailed instructions here on the Duet3D Dozuki. Once added, it will display an “ok” in the Monitor window. Now issue M552 S1 to enable the WiFi Module. It will now connect to your network and list an IP after 20-30 seconds. Note: If you disconnect the Duet WiFi before you’ve made the necessary changes to the config.g file using the Web GUI to ensure the WiFi module start up automatically at each power up, you just have to connect using YAT and enable the module again by issuing M552 S1. If you can’t connect to the Web Interface even though it displays an IP in YAT, try disabling WiFi (M552 S0) and then enable it again (M552 S1). Now that we have done all the terminal work in YAT, we can connect to the nice Web GUI of the Duet cards. You just open your browser (I’m using Chrome) and enter the IP listed in YAT. In my case it’s 192.168.1.187 and we are now looking at the Web GUI of our Duet WiFi. Yours might look differently depending on window size of the browser and also versioning of the Web GUI. The lines I’ve marked in a red box should either be deleted entirely, or you can insert a ; in front of each of the lines, which means they are disabled. It can be nice to do this for future reference. The black box shows the startup setting for our WiFi module. The S1 means it’s turned on automatically. Click on Settings – General. In the area I’ve marked up with a blue box, you can see the current firmware. As we found version 2.02RC5 on the Github page for RepRapFirmware it means we can update this. From the olden days we had two different firmware files. One for the Firmware Version and one for the WiFi Server Version. These two have been combined (yay) into one, so we no longer need a seperate file for the firmware of the WiFi Server. In the area in the red box you can see current version of Web Interface which is 1.21.2. This is called DuetWebControl on the firmware page and is of this writing version 1.22.5 meaning we also need to update this. We will start by updating to the newest firmware, which you can do by clicking Upload File(s) button and find the firmware file we downloaded previously, or you can simply drag and drop the firmwarefile onto the same button. Find the firmware file and just double-click it. Just click Yes to start the updating process. Once the firmware version updates to reflect the new firmware file, the updating process is complete. Next up we just do the same for the Web Interface. Just double-click the .zip file and the update starts automatically. If you’r quick, you can see how the individual files are being updated. Next step is to head over to the online RepRapFirmware Configuration Tool and run through the guided setup to configure your machine. When finishing the wizard it will generate all the necessary files for you, which you then upload to your Duet WiFi. I’ve always used Custom Setup, as all my machine are build by myself, so I can’t really comment on the various templates, but regardless of what you do, you should look at this as a basic setup starting point, as you will need to make some manual changes in various files afterwards. Duet WiFi – Activate and connect the WiFi… when it doesn’t work! Guess we’ve all tried it.. just can’t get the WiFi to connect to our home network. Especially after a firmware upgrade. For some reason the non-macro manual method doesn’t always work, and I’ve learned that the most simple solution then, is to create a macro file with the needed info and execute the macro. This post is a boiled down version of my Duet WiFi/Eth – Recover from Erase + basic setup post. We need to create a small macrofile to make it connect to our WiFi. I tried doing this manually without the Macro, but I simply just could not get it to connect..
After a few seconds you should see a message that it has connected to your access point and display the IP it has recieved. Enable the M552 S1 command in config.g – if it’s not in there, then just make a new line and type it in. It’s usefull to know how the structure is supposed to be on the SD-card and also to know the function of each of the files and more info. Since I just changed my old cartridge for a 24v 80w heater on my 5way Diamond hotend and used High Temperature Liquid Gasket Silicone as a sealant on the heatsinks and the Diamond nozzle itself, as is clearly evident on the photo, I need to do a new PID tuning, which is a good starting point for writing a short blog-post on doing just that. Debug – Failing to tune? M307 H1 to display the parameters we garnered from the PID tuning. Finally you could use M500 to store the parameters in a config-override.g file, which matches the old school Eeprom M500, and overrule the settings in config.g file. I personally have an aversion to this sort of having configurations stored in different places. Especailly for core parameters that shouldn’t change. In my opinion it just leads to confusion as people tends to forget they have anything stored in the override file and can’t figure out why the printer doesn’t accept the new parameters written in the config.g file. I prefer to put my hotend close to the heated bed, heat the bed to my most used temperature and then turn on the object-cooling fans at maximum before doing a hotend PID-tuning. I prefer to similuate actual printing situation to get a PID tuning that most closely matches the actual usage scenarios of my printer. To actually do a PID tuning we need to use the M303 command followed by H1 to denote the heater used, which is the first heater. If you PID tune your bed, it is H0 by default. Next we need to define the amount of power we feed our heater cartridge. This is denoted by P followed by a number like P1 for 100% power and P0.5 for 50% power. RepRapFirmware used to be very, very restrictive regarding power setting. I had to put it at P0.1 (10%) to do a succesfull tuning in january, but His time I could run it at P1 (100%). Finally we need to define target temperature using S followed by temperatures in celcius like S220 for 220c. Target the temperature you use the most. So 200ish for PLA if that is what you print, or 240 or something like that, if you mostly print ABS. As mentioned above I’m not a fan of using the M500 to store in config-override.g method, so I’ll get the result from the PID tuning using M307 H1 and put it into my config.g file. * Default is PID for hotend, so we don’t need to write parameter for this. * Default for BED is Bang-Bang method, so you’d have to add B0 in the end, to force it to use PID. Which means we are going to add this line to our config.g file. 4.2) I’ll add this in my Heaters/Hotend section. 5) Debug – Failing to tune? There are different reasons why it migh fail to tune. Solution: Try using a lower temperature. It might fail if it took too long to reach the target temperature. Solution: You need to wait for temperature to get almost back to room temperature before trying again. I accidentially hit the Erase button on the edge of my Duet WiFi card, which means it wiped my firmware from the controller! Luckily it didn’t wipe my SD card, so my config files didn’t go missing on me. I still need to setup my controller again though, and while I previously did write a blog-post on doing that, it was a long time ago and a lot has happened since then on how things are done, so I decided to do a new writeup on it. Also, since it wiped the firmware from the controller, I am now unable to connect to it the regular way, which we need to solve. In order for your computer to communicate with the controller using USB, we need to get the drivers from DC42s Github driver folder.We also need to download the newest firmware and it’s a good idea to download the SD-Image folder to give us a new set of files for our now defunct printer.All in all, it is easiest to just click the Clone or download on the main RepRapFirmware Github page and select Download Zip, which you extract somewhere easy to find and use. In the directories you just unzipped go into RepRapFirmware-dev/Driver folder and right-click on duet.inf and select install to install the drivers. In the Getting connected to the Duet WiFi they suggest using a dedicated terminal program to setup the controller/firmware, but I really much prefer using Pronterface/Printrun, as it also has pure terminal function and in my world is essential to configuring and checking any 3D Printer. I vastly prefer it over any form of terminal function in all slizers as the slizers comes with some configured settings which can screw up the result you get when moving and axis or sending a command to check a function. So, go to the download page for Pronterface/Printrun 3D Printing Host Suite and select the version fitting for your type of computer. Note: The program is named SD Formatter 4, but they have a version 5, which is a bit strange. Some of you are going to wonder about why we need a dedicated program to format the SD card, and the answer is quiet simple: To avoid/minimize the risk of the SD card turning bad, either turning completely unuseable untill reformatted, or just performs really bad, with slow speeds. The program simply just does a much better job of preparing SD cards correctly and it can even fix many annoying problems many people experience now and then on their printers. Go to the SD Formatter (4/5) Download page, scroll down and download and install the version for your system. 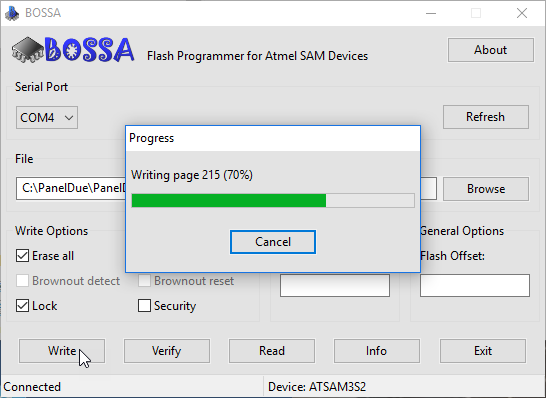 Since I hit the erase button on the Duet WiFi I can no longer talk to it using Pronterface, as we first need to burn the firmware onto the controller using SAM-BA 2.17. I don’t know why it has to be 2.17, but the specific version is listed on the Fallback description on the Duet wiki. Install it after downloading and leave it open. Connect the Duet WiFi to your PC via USB. Press the Erase button on the Duet WiFi, then the Reset button. Load SAM-BA. It usually detects the correct COM port automatically. Select board at91sam4e8-ek. Press Connect. In the Send File Name box enter or browse to the DuetWiFiFirmware.bin file to be loaded, then press Send File (leave the Address at the default of 0x400000). On completion it will invite you to lock the region; press Yes. To verify the writeprocess press Compare sent file with memory. Press Reset on the board. You should now be able to connect via USB/Pronterface. Source for this section was found on the Duet Wiki. Format your SD card using SD-formatter – remember to copy out any config-files you might want to save. Now navigate to the folder RepRapFirmware-dev\SD-image you downloaded in Step 1. Connect to the DuetWiFi using Pronterface and issue the command M997 S0:1 which is going to install/update both firmwares. Note: I know we allready have the newest DuetWiFiFirmware on it, but easier to remember just one command. Wait for it to finish and disconnect as it’s restarting. In this post I’ll go through updating firmware on the PanelDue. It’s really not that difficult, but as always, it can be a bit of a chore figuring out the location of and type of files we need to use. You can check your current version by clicking Setup on your display. Mine was version 1.14 – This is in itself not important for this post, but just nice to know. In order to figure out the version of PanelDue we own, we need to look at the back side of the PanelDue PCB. Mine is V2 as can be seen here. In order to update our firmware, we need to get a program called “Bossa”. Go to their Github page and download the file fitting for your system and install it. Next step is to Erase and Reset the device to make ready for new firmware. Some of these steps are taken from the official page. Press and hold the Erase button of the PanelDue for at least one second. Release the Erase button, then press and release the Reset button. If you have a version 2.0 board then the backlight will turn off. Identify the COM port number or port name of the PanelDue board on your PC. If you use Windows, you can do this by pressing CTRL+Pause/Break or via Start->Control Panel->System->Device Manager. Then expand Ports (COM and LPT), and look for Bossa port. If you can’t find the port, try repeating the Erase and Reset sequence, or disconnecting and reconnecting the USB cable, or try a different USB port on your computer. We are going to use the program Bossa we downloaded and installed previously, but you can also use the command prompt. I’ll list the command for the commandline option, but I have not tested it. Taken from the official page. Run Bossa as Administrator and select the Serial Port we verified above. You must put a mark in Erase all, Boot to flash and Lock. Hit Write and wait for it to finish and click OK.
Now hit the Reset button on the PanelDue PCB and display should come back online. Remember to adjust baud to match your settings in your controllers firmware. As some might know, I’ve been working on a version 4 of my Belted Extruder and am now ready to put it to use on my primary printer, which has been using a single extruder so far. We allready have X,Y,Z,E0 which are labeled 0-3 so our new drive is nr. 4. I’m using 1/32 microstepping for both extruders, so just adding :32 to the existing line. I have not yet calibrated it, so inputting 2050 to go from, after steps defined for our first extruder. For now, I only have 1 hotend on this printer, but 2 extruders. I’m using a normal E3Dv6 1.75mm bowden, so I’ll just swap over the bowden tube to the extruder I’m going to be using. It all means I’m not adding any new heaters for now. P is the Tool Number, D is Extruder drive, which is not to be confused with machine Drive number we defined above. H is the Heater we use with our new tool. Note: You can combine the #2-3 G10 commands if you like.